I think this is one of my favorite images from our time in Botswana last November. While camping in the Okavango Delta I didn't expect to do any night photography because of the density of animals around the area, but as luck (or misfortune) would have it our truck got stuck and we had to camp in the bush. Despite being stuck we made the most of it and was able to get this image as we hung out in Paradise Pools in Moremi National Game Reserve with Hippos and other animals grazing around us all night! This is a single exposure with foreground lit from a helper using a high CRI flashlight. 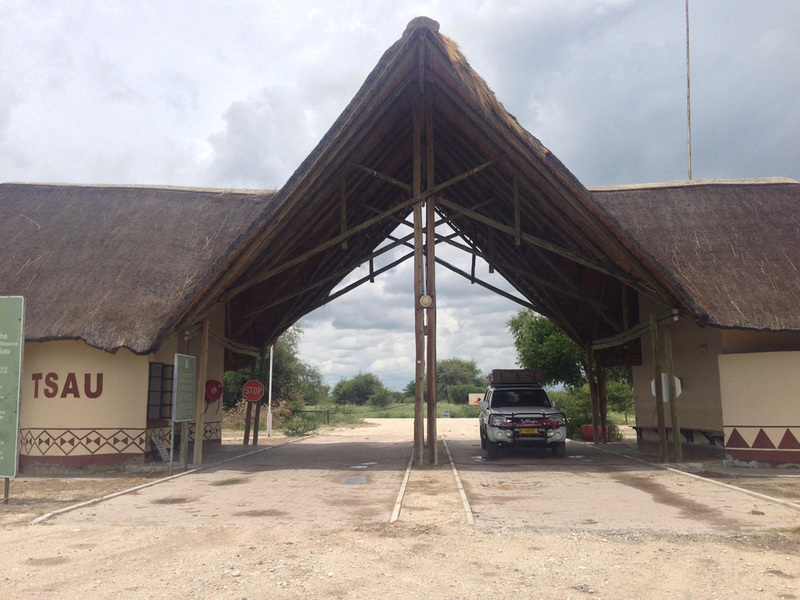 We drove for 250km through Botswana at first on tar road, but after 100km we turned off onto a 2 track dirt road, we wouldn’t see tar for 5 days. With each additional kilometer we were heading deeper into the remote vastness of the Central Kalahari Game Reserve. Had we packed enough fuel, water and food? We felt confident planning it out, but now after 5 plus hours to get to our first campsite and only seeing 1 other vehicle we might have second guessed ourselves if we weren’t simply entranced by the massive remote wilderness we had entered. Our first night Eli and I camped in Passarge Valley. When we arrived that night we relished our newfound solitude. We had passed the only other campsites on the way in at 40 and 20km away respectively. Compare to other campsites where you are rubbing elbows with others while washing up at the camp sinks or chatting up people while setting up camp. In Passarge we had the whole valley to ourselves. No fences around the campsite, no bathroom (except for a toilet seat on a hole in the ground) and no showers (except for a bucket hoisted up on a pulley). The best part by far though was no other people to distract you from nature. The fun of camping for me is the do-it-yourself mentality and also getting back in-sync with nature’s schedule (i.e. being mindful of the sun and moon’s movements). One can get these experiences in their backyard, but after so many camping experiences I’ve always wanted to find the more unique locales. 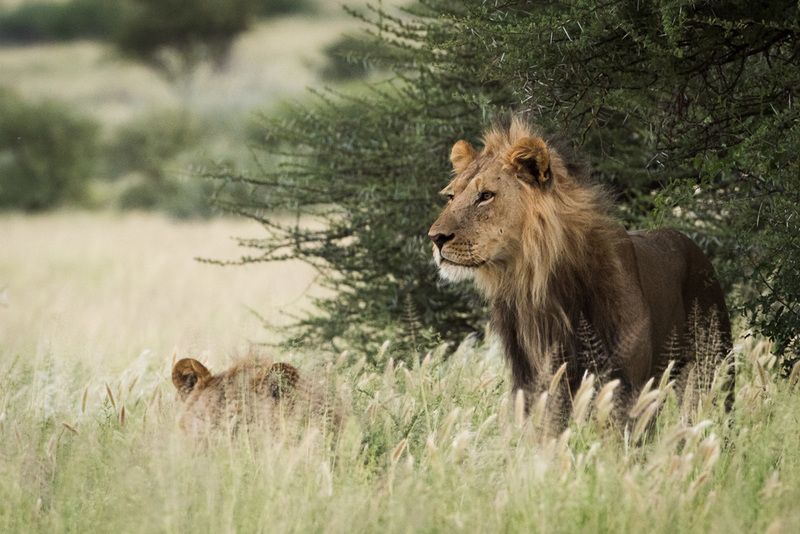 Being out in CKGR brings all the joy of backyard camping and adds on little things like not having basic amenities available, extreme solitude, and of course, the option of lions in your camp. I had heard stories of lions and other predators in your camp before and always of hoped it happened at a convenient time as opposed to while making dinner for example. Our second morning as we headed out, sure enough, we saw lion tracks in the sand over our truck's tracks. Two sets of huge tracks led directly from our camp out towards the main road. No telling when they came through as we heard nothing that night. I’m not sure if I was more excited to see the tracks or concern that we had two huge male lions wandering around our camp without making a sound. That day we drove out of Passarge and made our way to Deception Valley. 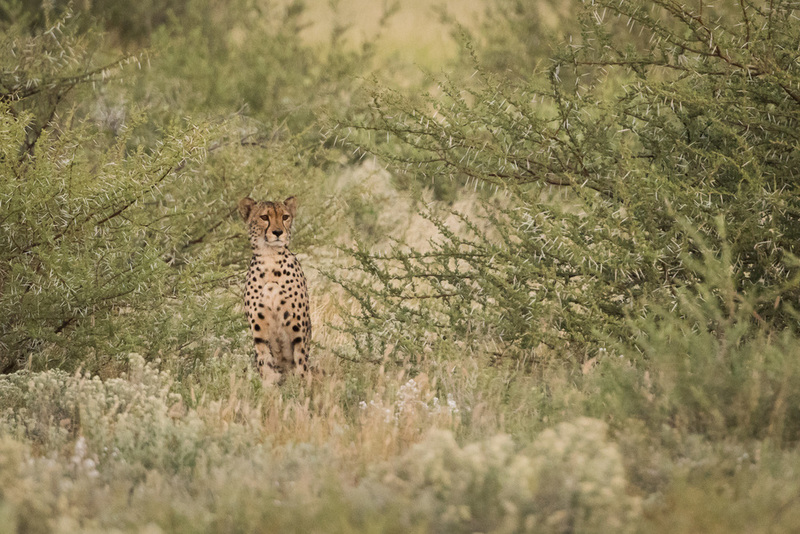 Eli was especially excited to visit Deception as it was the main encampment for the Owens Researchers in the eighties where they explored the park for many years and wrote Cry of the Kalahari following their time there. Deception Valley did not disappoint. The huge open plains within the main part of the valley held some of the largest herds of springbok we had ever seen. In addition, were tons of Oryx, Ostrich, and many other herbivores. Perfect food choices for a predator. We enjoyed the expansiveness [sB1] of driving around Deception and Sunday Pan and only saw a couple other vehicles containing no doubt other like-minded adventure seekers. We saw so few vehicles that when we did spot someone both cars would stop for a moment and have a chat about their animal sightings, the general awesomeness of the park or to trade supplies. Our last day as we were driving out of the park a group of four guys in a rental 4x4 covered top to bottom in mud had proposed to trade us some wine and cash in exchange for some of our fuel. We had 3 full jerry cans so we agreed as we were heading out that day, but were a little concerned as the guys said they were extremely low on fuel and had another 4-5 days in the park. For reference, we only spent 4 nights in the park and used over 100 liters of fuel and traveled 1100km! I hope they made it through okay, although based on their wine supply I’m sure they did just fine. While the Deception campsite was nowhere as quaint as the Passarge site, we did enjoy the proximity to both Sunday Pan and Deception Valley. We had neighbors next to our campsite, but the sites were spaced far enough apart to still feel alone and the amenities were still of the same spartan nature. One day going on a tip from park rangers we came across, we headed to Sunday Pan in search of what was described as “some lions in the bushes.” We both laughed when the guys told us that, because Sunday Pan is huge! And of course all there is, is bushes. Regardless, it was the only tip we had, so we headed there. With Eli’s eagle eye spotting he eyed the top of a lioness’ ear amongst the grasses and under some bushes no less! 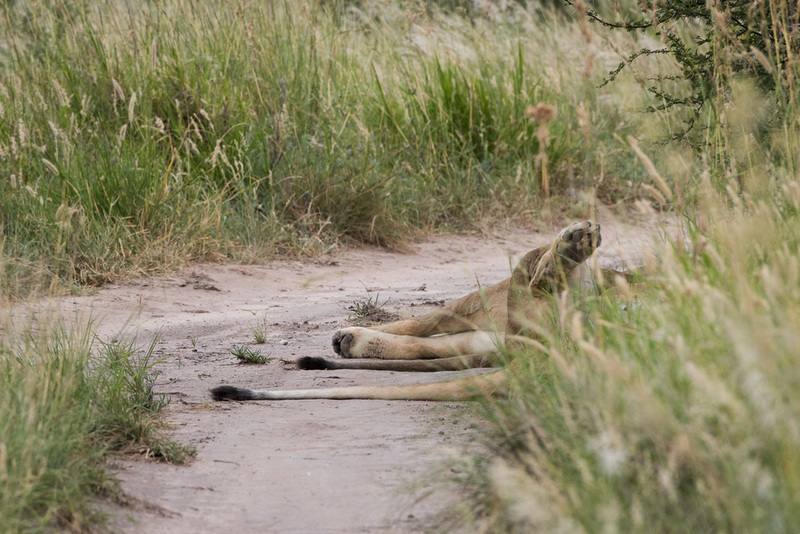 As we settled in to watch, not one but six lionesses emerged from the bushes and made their way to the road where they proceeded to lay about for the next day and a half. We watched the lionesses that morning, returned that evening and even came back the next morning on our way out of the park to check in. Sure enough, they had only moved about 50 meters or so in the 2 days. With so many opportunities to take photos we both got some nice shots especially in the evening when they all perked up and appeared interested to hunt, but unfortunately never did. 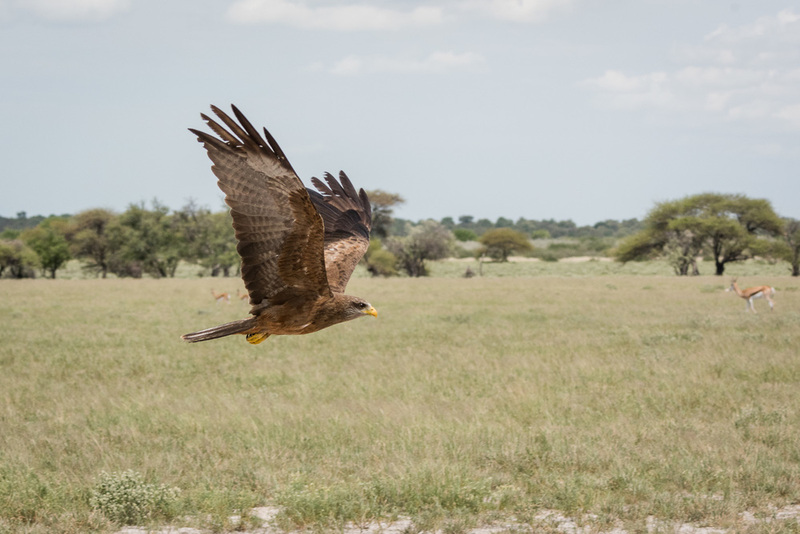 Other animal sightings included a great encounter with an adult female cheetah, two sets of male lions, lots of bat-eared foxes (sightings everyday), many birds of prey including various eagles and falcons and, as I mentioned before, impressively large herds of herbivores. The animal sightings were really amazing and almost every sighting we had to ourselves which made the peaceful solitude of the wilderness even more special. 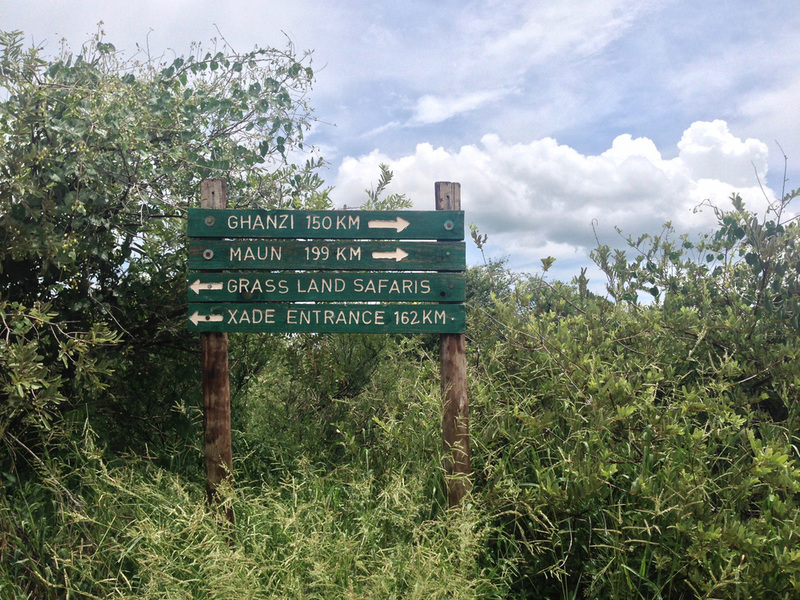 After 5 days in the park we had to start the 250km track back to Ghanzi. While our fears of running out of resources was passed we had used up just about all our water on the last day which could have put us in a bind should we have gotten stuck on the way out. In any case, after we traded the fuel for the wine we headed out and after about 6 hours made it to Ghanzi and had the most refreshing shower. While the bucket shower was enticing at the campsites, the fear of using all the water overrode that notion. We made it out unscathed and with lots of photos, stories and experiences. However, returning to civilization that night we realized we need to bring more water next time for showers - we smelled. 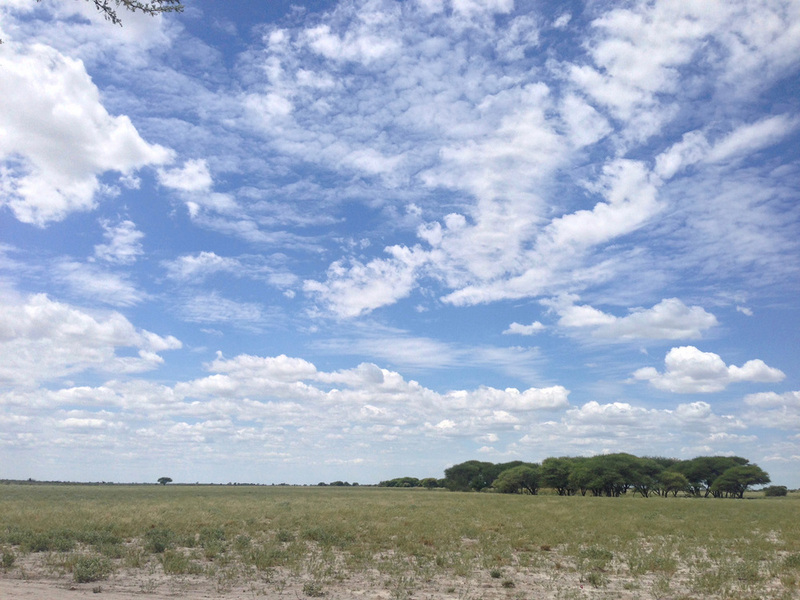 Our friend Annemarie, Stephanie and I just got back from an amazing road trip and safari through Etosha National Park, the Caprivi part of Namibia and Chobe National Park in Botswana. We spent about 12 days on the road and covered almost 3000km by the end of the trip. 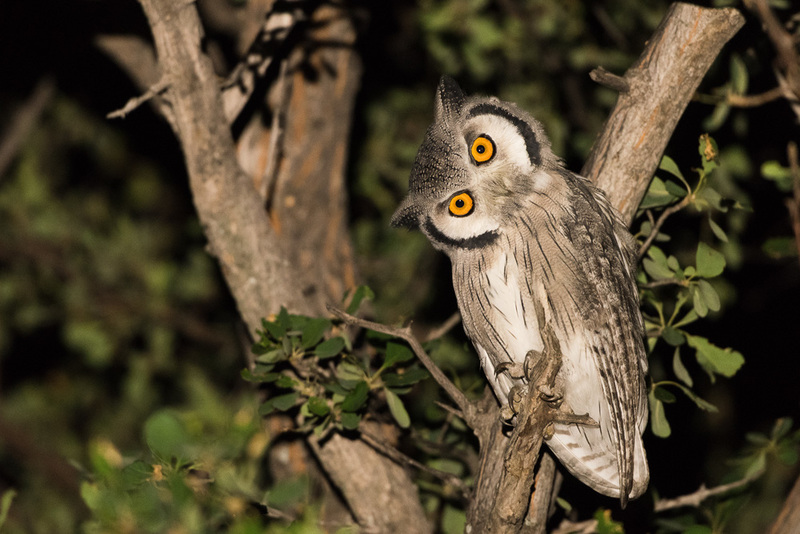 While the majority of the trip was met with some amazing wildlife sightings the last day of the safari was by far the best sighting of the trip. While in Etosha we saw tons of elephant, giraffe, all sorts of antelope and even a leopard and a couple rhinos. In the Caprivi region we saw many hippos, crocodiles, lots of nice birds and of course elephants and interesting antelopes. It was only in Botswana in Chobe National Park that we really started to see some special sightings. On our 10th straight day of safari we had seen a lot of really nice wildlife, however, the heat of Savuti which is deep in the heart of Chobe NP was starting to get to us. Up until we reached Savuti we had camped and stayed in lodges that were in nice scenic areas or right along the river. Savuti, normally a marshy area fed from the Savuti Channel, was completely dry and was surrounded by deep hot sand. The drive into Savuti from North Botswana was about 2 hours of 4x4 deep sand driving mostly in 2nd gear. The sand was hot and the car was working hard so was also hot. Once we reached the camp it was midday and not a cloud was in the sky. Our campsite was a deep sand pit under a tree and it must have been 100+°F in the shade. Because the channel was dry there were only two manmade water points in the area to visit. Each waterhole had just enough water to supply the animals, but not enough water to fill the waterhole. It was a strange sight to see elephants crowded around the small hole in the middle of the waterhole drinking the water as fast as the pump could get water through the pipe. After 2 hot days of driving safari we had a few nice sightings of single spotted hyenas, loads of male elephants and plenty of wildebeest, tsessebe antelope and interesting raptors. We even had a nice sighting of a Marshal Eagle feasting on a recently killed Guinea Fowl in a tree. On our final day we woke around 5am to the sound of Lions calling each other. The sounds gave us some good motivation to get up, pack up and start the search for the nearby lions. Just as we left the camp we noticed that there were two sets of Lion tracks walking along the sand road next to our camp nearly 20 feet next to our tents. Motivated even more by the close sighting we set off in the direction of the lion's call. Only about 1-2km from camp we found our single male lion resting under a bush. We could still hear the call of the other male lion maybe 2-3km from us, but we elected to stay with this lion for a while and enjoy the nice sighting. Energized by the sighting that morning we safaried around for the morning and returned to camp before lunch when it was too unbearably hot to be out anymore. After spending the hot part of the day at camp we packed up and set off around 4pm for our last safari drive of the trip. As we stopped by the sightings board at the park gate we noticed a single green pin the southeastern part of the park. Green meant Wild Dogs were spotted that morning. Stephanie hastily grilled the park ranger on duty when they were spotted and exactly where. They had been spotted early that morning at Rhino Vlei - a dried up waterhole about 10km away. We set off immediately at quite a clip. If the dogs had been spotted in the morning there was only a small chance they would stay in the same area for the duration of the day as they are quite nomadic. However, because of the heat there was still a chance they could decide to only move at the cooler dusk and dawn. We drove probably a little too fast for the park, but it was still hot so almost no animals were on the roads. We arrived at Rhino Vlei about an hour later and started the search. After only about 30 minutes we drove down a side road near the former waterhole and passed a huge tree that grew like a shrub with tons of shade underneath it's canopy. As soon as Stephanie and I finished verbally agreeing that the tree looked like a nice shade spot we spotted a wild dog nearly 10 feet in front of the truck just aside the tree and next to the road. We found them! We switched off the truck immediately, but the dog didn't care about us at all and just lied there. After repositioning the truck for a better viewing spot we settled in to watching as five adult Wild Dogs slowly emerged from the tree and then three additional pups. The shock of actually finding the dogs still hasn't worn off. Since first coming to Namibia almost two years ago this animal has been at the top of the animal sighting wish list. We ended up spending about an hour and half with the dogs as they rested in the shade. The pups played here and there which was amazing to witness. It was only when the sun was just touching the horizon when the dogs all spring up into action. Being such a social animal all the dogs started nuzzling, licking, playfully biting and rubbing against each other along with communicating with their trademark squeaks. Savuti challenged us mentally, but the rewards far surpassed all the challenges and in the end made the trip. It was an epic ending to an epic trip as the Wild Dogs and then us drove off into the sunset.